Alexander Zverev leads the H2H 4-1 (1-0 on clay) including winning their recent four meetings. Zverev can serve as good as Marin Cilic (to an extent) and can do a lot better in other departments than the Croatian which makes him the favorite in this contest, but fatigue could be an issue for the German. Marin Cilic comfortably dispatched world #11 Pablo Carreno Busta in straight sets, 6-3 6-3, to progress into the semifinal of Rome Masters for the first time in his career (ten appearances). This is, in fact, Maric Cilic’s first-ever semifinal appearance in a clay Masters 1000 event, as reaching the quarterfinals of Rome in 2017 and Monte Carlo on few occasions are his previous best. “I’m feeling great after reaching my first semi-final on clay at a Masters 1000 event. That’s a good achievement. I was waiting many years for it to happen, so it’s definitely a happy moment for sure.” – Marin Cilic after defeating Pablo Carreno Busta in Friday’s quarterfinal. Marin Cilic needed a good run like this before entering the second grand slam of the season (Roland Garros) considering he failed to make a semifinal appearance in any tournament since finishing as the runner-up at the Australian Open in January 2018. Alexander Zverev extended his winning streak to 12 after defeating the Belgian #1 and world #10 David Goffin in the quarterfinal, 6-4 3-6 6-3. It was an impressive performance from the German considering he was able to fight for three hours and emerge victorious against David Goffin, who was relatively a lot fresher than Zverev. Two weeks back in Munich, Alexander Zverev successfully defended his Munich title and lifted the third Masters 1000 title of his career at Madrid in the following week. Being the defending champion, the German #1 is now looking to defend his title in Rome this week. In his young career, Alexander Zverev has already outperformed the experienced Marin Cilic in the Masters 1000 events. 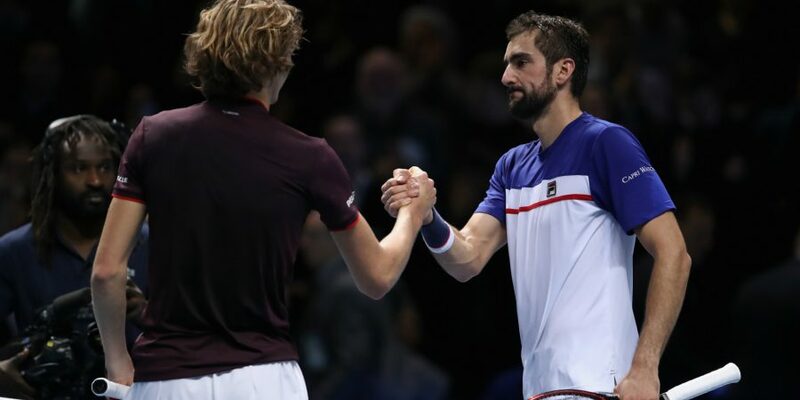 Cilic has won just one Masters title so far in his career (2016 Western & Southern Open) while Zverev has three of them (Rome, Madrid, and Montreal). Additionally, Zverev has a 4-1 record in the semifinals of Masters 1000 events while Marin Cilic has gone 1-2.